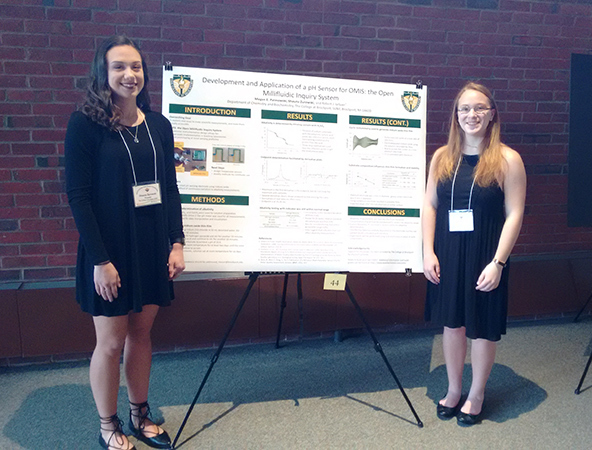 On April 28th, 2018, my first two undergraduate students at Brockport gave their first poster presentation at a professional meeting. Shauna and Megan – ready to answer the tough questions. The meeting was held at The College at Brockport this year. There were 50 or so posters and about 100 attendees. We also had a few oral presentations and the keynote speaker was Brockport alum Dr. Michael Nicholson of Precision BioSciences. Megan and Shauna presented their first semester’s work on developing sensors and methods for OMIS: the Open Millifluidic Inquiry System. Shauna is developing a method to perform alkalinity measurements in small volumes under dynamic flow conditions and Megan is working on a pH sensor based on anodically electrolyzed iridium oxide films. They’ve made some great progress not only building confidence in their laboratory skills but also learning how to present their research (in addition to actually doing the work). I’d consider that a good set of outcomes for their first semester in independent study (as Freshmen, no less). Expect big things from these ladies. P.S. Happy Star Wars Day.